Introduction: After two years of watching the Ford Mustang enjoy tremendous success, General Motors finally launched its entry into the pony car segment, the Chevrolet Camaro. Although available with a mediocre six cylinder for volume sales, the Camaro could be equipped with several V8s and a myriad of performance options. Then, of course, was the famous Regular Production Code, Z/28, that would change the industry’s view of pony cars. Comments: Inspired by the success of the Ford Mustang, Chevrolet launched its own pony car, the Camaro. Chevrolet stated that the “Camaro” was named after the French word for “comrade,” although some linguists argued that it was actually Spanish for a type of shrimp. Not exactly an awe aspiring name for a new pony car. Luckily, the Camaro had the muscle to back up its case. The Camaro was based on the upcoming 1968 Chevy Nova platform, and featured a unibody structure from the windshield and firewall back, with a separate steel rail subframe for everything up front. The Camaro was available from the start in hardtop coupe and convertible body styles, and could be order with nearly 80 factory options and 40 dealer accessories, including three main option packages and a choice of four different engines. The RS package included numerous cosmetic changes including a blacked out grill with hidden headlights, revised parking and tail lights, upgraded interior trim, and RS badging. Of greater interest to enthusiasts was the SS package which included as standard equipment a modified 350 cid V8 (the first 350 engine Chevy ever offered) with an available 396 cid big block producing 325bhp (L35) and later a 375bhp version, along with simulated air-intakes on the hood, special bumble bee striping, and a blacked out grill. 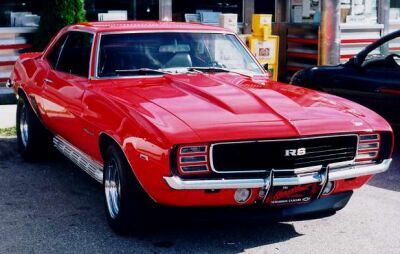 It was possible to order both the RS and SS packages, and get a RS/SS Camaro, in which case the RS badging took precedence. 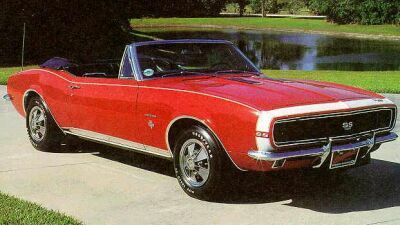 Camaro popularity soared when a RS/SS Convertible with the 396 paced the 1967 Indianapolis 500 race. In December 1966, Chevrolet then quietly released one of the most famous options codes of all time, option Z-28. 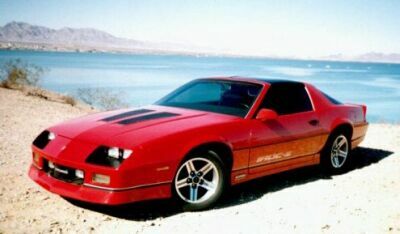 Unpublicized and unknown by most of the buying public (and most Chevrolet sales people for that matter) and not mentioned in any sales literature, the only way someone could order the Z-28 package was to order a base Camaro with the Z-28 option, mandatory front disc brakes with power assist, and the Muncie 4-speed transmission. You could not order the SS package, automatic transmission, air conditioning, or the convertible. What you got was a unique 302 cid small block (Non-California emission cars were labeled MO while California emission engines were labeled MP) that was created by taking the 327 block and installing the short-stroke 283 crank. Specifically designed to compete in the Club of America Trans Am racing series which placed a 305 cid limit on its entries, the Z-28 was available to the public solely to qualify the car for racing. Advertised horsepower was listed at just 290bhp, which was not very impressive until one hooked it up to a dyno and got actual readings of 360-400 bhp. 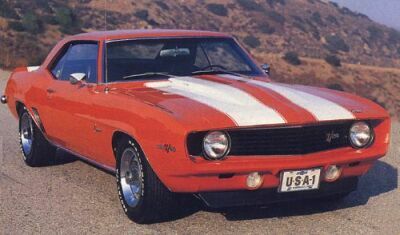 The Z-28 also came with a competition suspension, broad racing stripes on the hood and trunklid and could be combined with the RS option package. There was no Z-28 badging at all, lest it attract to much attention. The Z-28 proved to be difficult to launch on the street because its high reving engine was lethargic under 4000rpm and worked best when it was shifted at 7500rpm (!). Once it got going, the Z28 was tough to beat and boosted a 140mph top speed and numerous racing victories. Only 602 Z-28s were sold in 1967, making it a truly desirable collectible. 250 I6 155bhp @ 4200rpm, 235lb-ft @ 1600rpm. (Z-28) 302 V8 290bhp @ 5800rpm, 290lb-ft @ 4200rpm. (Z-28) 302/290bhp: 0-60 in 6.9 sec, 1/4 mile in 14.85 sec @ 101mph. (SS350) 350/295: 1/4 mile in 15.4 seconds @ 90 mph. (SS396) 396/325bhp: 0-60 in 6.0 sec, 1/4 mile in 14.5 sec @ 99mph. Comments: The 1968 received minor changes for its second year. The grill took on a more horizontal look while the vent windows were dropped and “Astro Ventilation” (i.e. flow-through ventilation) was added. Side marker lights were added while the SS396 received revised chromed hood inserts (the SS350s stayed with the 1967 styling). Underneath, the 1967 Camaros pesky axle tramp was cured by the addition of multi-leaf rear springs to replace the single-leaf units and rear shock absorbers were now staggered. A new 350bhp 396cid option for the SS was added, while the Z-28 option (now just labeled MO) actually received some publicity and sold 7,199 units. The Z-28s were now easier to spot as they sported Z-28 or 302 badges. Comments: 1969 saw several noteworthy changes to the Camaro. The grill became deeper set, the tail lamps were longer and thinner and broken into three segments. A heavy “eye-brow” crease was added on the both sides of the car extending from the front wheel well to the rear wheel well. A matching crease went from the rear wheel well to the rear quarter panel. The Camaro also received new fenders, door skins, rear quarter-panels, grille and taillights which gave it a wider, lower appearance. Inside, the Camaro received a redesigned dash and more comfortable seats. Endura rubber bumpers were available on the Camaro as well as two ram air induction systems for the SS. The first was a new special hood with a rear facing inlet and cold-air duct underneath the hood. The second was a dealer installed cowl plenum kit that came with a special air cleaner and adapter. No special hood was needed. 1969 saw an explosion in engine choices. On the low-performance side, a new 307 V8 (a 327 crank in a 283 block) rated at 200bhp was added and a new 350 V8 rated at 255 bhp replaced the more powerful 327 engine. The Z28 continued with its seriously under-rated 302 (now called DZ) engine. The RS package was still popular, and included a special grill with concealed headlights (of a ribbed design) and washers, chrome wheel well moldings, drip rails, pinstripes, and RS badging. The SS standard 350 received a slight power boost to 300 bhp while the 396 engines continued in 325/350/375 bhp versions. Once again, a white RS/SS convertible with the 396 engine paced the Indianapolis 500 race, and Chevy offered replica versions as white convertibles with orange stripes and orange houndstooth upholstery (though most replicas were powered by 350 engines. Because of their collectibility, there are many “fake” 1969 Pace Car replicas out in the collector market so be careful if you are planning on buying one. But real performance is more than special upholstery and the big news for 1969 was the availability of special 427 cid V8 equipped Camaros. The first were special dealer-installed units, most notably the Yenko Camaro 427. Yenko Sports Cars, based in Pennsylvania, along with other Chevy dealers such as Nickey in Chicago, Dana in California, and Baldwin-Motion in New York, would install the L72 427 cid block, rated at 425bhp by Chevrolet, ordered under the Central Office Production Order System (COPO) code 9562 into a buyer’s Camaro. 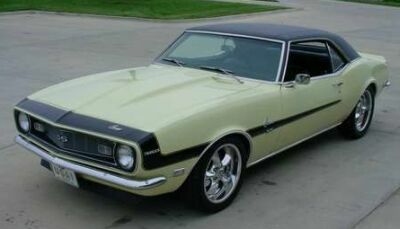 The Yenko Camaro 427 is a typical example: it came from the factory with no ornamentation, badging, and the 427 engine in a crate. Yenko installed the 427 block, changed the rating to a more realistic 450bhp, and added 15-inch rally wheels, bigger front roll bar, and sYc (Yenko Sports Car) badging. A full complement of racing add ons were available and sub 13 second quarter miles were possible with a few more dollars. Overshadowing these dealer modified Camaros was the factory Camaro ZL1. Specially designed to compete in the NHRA Super Stock drag classes, Chevrolet made it an option under the COPO system (code 9560). The cars began as SS396/375bhp Camaros with the F41 suspension. The SS trim and engine were deleted, and the 427 engine, cowl-induction hood, front disc brakes, a choice of heavy duty 4 speed transmissions or Turbo Hydra-matic, and a 4:10 posi axle were added. But instead of the regular iron-block and head L72 found in the dealer installed Camaros, the ZL1 sported aluminum heads and the first aluminum block ever made by Chevrolet. It shared the L88 aluminum head/iron block’s engine rating of 430 bhp but made closer to 500 bhp — making it probably the most powerful engine Chevrolet ever offered to the public. The engine weighed just 500 pounds, the same as Chevy’s 327 small block. The car was blessed with a 5 year/50,000 mile warranty and was fully street legal. With factory exhausts and tires, it turned low 13s; with headers and slicks, it could turn 11.6s @ 122mph. This was the fastest car ever produced by Chevrolet. Performance had its price — $4,160 for the ZL1 engine alone pushing the price of the Camaro ZL1 to an unbelievable $7,200 (about double the price for a SS396 Camaro). Chevy needed to build 50 to qualify the car for racing, and in the end built 69 Camaros and 2 Corvettes with the ZL-1 engine. Their high price made them difficult to sell and at least 12 engines were removed and about 30 cars were returned back to Chevrolet. It took until the early 1970s to sell them all. One can only wonder what they are worth today. Production of the 1969 Camaros continued into the beginning of 1970 as the all new 1970 Camaros were not released until mid 1970. To add to the confusion, some late 1969 cars were titled as 1970 models. Z28: 302 V8 290bhp @ 5800rpm, 290lb-ft @ 4200rpm. 307 V8 200bhp @ 4600rpm, 300lb-ft @ 2400rpm. (SS350) 350 V8 300bhp @ 4800rpm, 380lb-ft @ 3200rpm. (COPO 9561) 427 V8 425bhp @ 5600rpm, 460lb-ft @ 4000rpm. (COPO 9560) 427 V8 430bhp @ 5200rpm, 450lb-ft @ 4400rpm. (Z-28) 302/290bhp: 0-60 in 7.4 sec, 1/4 mile in 15.12 sec @ 94.8mph. (SS396) 396/375bhp: 0-60 in 6.8 sec, 1/4 mile in 14.7 sec @ 98.7mph. (COPO 9561) 427/425bhp: 0-60 in 5.4 sec, 1/4 mile in 13.5 sec @ 102mph. (COPO 9560) 427/430bhp: 0-60 in 5.3 sec, 1/4 mile in 13.16 sec @ 110 mph. Introduction: After just three years, Chevrolet released their second generation model halfway through the 1970 model year. This generation would last over 12 years and would see the once mighty Camaro become strangled by crash and emission standards. Note: All engine ratings for 1970-1971 are in SAE Gross figures. All engine ratings for 1972+ are in SAE Net figures. Comments: Despite ominous predictions of the collapse of the pony car market, and development delays, the new Camaro was released with much fanfare and much success late in the 1970 model year. Most of the credit went to the new styling, which was European-inspired (some would say “Ferrari inspired”) and would prove so popular that it would last until 1982. Still based on the Nova, the new Camaro was two inches longer and had five inch longer doors, and was now available only as a coupe (no convertible). It featured a new A-arm front suspension and better noise insultation. Under the hood, the proposed new 454 blocks never made it and the Camaro SS continued with the 350 and 396 engines. After January 1970, however, the 396 engines no longer displaced 396 cubic inches. Chevrolet actually enlarged them to 402 cubic inches but the executives decided to name it the 396 to take advantage of the name recognition and avoid any attention from insurance carriers. The RS option now included a free standing grill, twin bumperetes, an Endura rubber grill frame, and parking lights between the headlights and the grill. The SS option included a special black grill, hidden wipers, power brakes, engine trim, white-letter tires, chrome dual exhausts, and the SS396 also came with black-painted trunk panels and a special suspension. The Z28 saw the most radical change — an all new 350 cid engine know as the LT-1 350. It was rated at 360bhp (it had a rating of 370bhp when installed in Corvettes). This engine proved much more tractable, reliable, and generally outperformed the 302 engine of old. 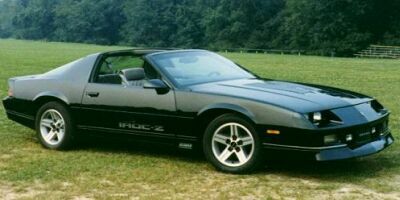 It was also available with an automatic transmission, the first time for the Z28. 250 I6 155 bhp @ 4200 rpm, 235 lb-ft @ 1600 rpm. 307 V8 200 bhp @ 4600 rpm, 300 lb-ft @ 2400 rpm. L-65 350 V8 250 bhp @ 4800 rpm, 345 lb-ft @ 2800 rpm. Z28: 350 V8 360 bhp @ 6000 rpm, 380 lb-ft @ 4000 rpm. SS350: 350 V8 300 bhp @ 4800 rpm, 380 lb-ft @ 3200 rpm. SS396: L-78 402 V8 350 bhp @ 5200 rpm, 415 lb-ft @ 3400 rpm. SS396: 402 V8 375 bhp @ 5600 rpm, 415 lb-ft @ 3600 rpm. Z-28: 350/360: 0-60 in 6.1 sec, 1/4 mile in 14.4 sec @ 99.1mph. 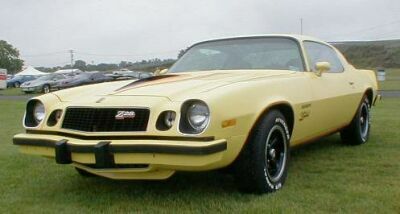 Comments: On the outside, the 1971 Camaro differed from the 1970 model mainly with the change to a high back seat with integrated headrest design. Under the hood, however, there were big changes. General Motors had decreed that all its cars for 1971 had to run on unleaded gasoline and this meant a drop in compression ratios and a big drop in power ratings. The Z-28 saw its 350 cid engine drop from 11:1 compression to 9:1 (which was still above the GM mandate of 8.5:1, but GM let it slide) and horsepower dropped to 330bhp from 360bhp. A new three piece rear spoiler for the Z-28 didn’t quite make up for the decrease in performance. Both the SS350 and SS396 (still with a 402 cid engine) saw decreases in power ratings and a proposed 400 cid engine never saw production. The RS package was still available with corresponding trim and appearance changes. 250 I6 145 bhp @ 4200 rpm, 230 lb-ft @ 1600 rpm. L-65 350 V8 245 bhp @ 4800 rpm, 350 lb-ft @ 2800 rpm. L48 350 V8 270 bhp @ 4800 rpm, 360 lb-ft @ 3200 rpm. Z28: 350 V8 330 bhp @ 6000 rpm, 360 lb-ft @ 4000 rpm. SS396: L-78 402 V8 300 bhp @ 4800 rpm, 400 lb-ft @ 3200 rpm. Comments: A 174 day strike at the Ohio plant where all Camaros and Firebirds were built severly limited 1972 model year production. 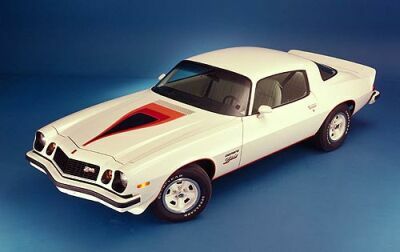 Even worse, 1,100 unfinished Camaros had to be scrapped because they didn’t meet 1972 federal bumper safety standards. With the declining performance market, there were many calls to cancel the Camaro. Luckily, cooler heads prevailed and the Camaro stayed in production. 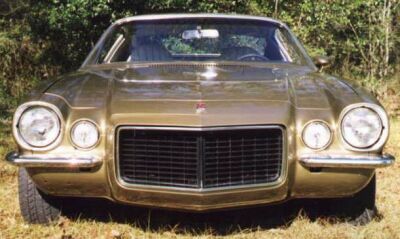 Visually, the 1972 Camaros had a revised grill with only seven vertical slats instead of the previous 12. Another GM mandate required that all power ratings be given in net terms (including all accessories). Although that led to drastic drops in peak numbers, the new ratings were actually more accurate than the old gross power ratings because they were a better reflection of the power that actually hit the road. 250 I6 110 bhp @ 3800 rpm, 185 lb-ft @ 1600 rpm. 307 V8 130 bhp @ 4000 rpm, 230 lb-ft @ 2400 rpm. L-65 350 V8 165 bhp @ 4000 rpm, 280 lb-ft @ 2400 rpm. L48 350 V8 200 bhp @ 4400 rpm, 300 lb-ft @ 2800 rpm. Z28: 350 V8 255 bhp @ 5600 rpm, 280 lb-ft @ 4000 rpm. SS396: LS-3 402 V8 240 bhp @ 4400 rpm, 345 lb-ft @ 3200 rpm. Comments: The big news for 1973 was the deletion of the SS option and the 396 (actually 402) engine, which left only the Z-28 with its 350 V8 to carry the performance banner. The RS option was still available and included revised front bumperettes which met the new Federal 2.5mph regulations. A new Type LT option was added as a luxury package which included a weak V8 (L-65) and several trim items. The Z-28 saw another decrease in power as hydraulic lifters replaced its solid ones. As a sign of the times, air conditioning was available on the Z-28 for the first time. Despite all this, production for all models was up. 250 I6 100 bhp @ 3600 rpm, 175 lb-ft @ 1600 rpm. 307 V8 115 bhp @ 3600 rpm, 205 lb-ft @ 2000 rpm. L-65 350 V8 145 bhp @ 4000 rpm, 255 lb-ft @ 2400 rpm. L48 350 V8 175 bhp @ 4000 rpm, 260 lb-ft @ 2800 rpm. Z28: 350 V8 245 bhp @ 5200 rpm, 280 lb-ft @ 4000 rpm. Comments: To meet new Federal government bumper standards, the 1974 Camaro was redesigned with thick aluminum front and rear bumpers. The only grille available (the special RS grille was dropped) was now shovel-shaped and the rear taillights wrapped into the fenders. Engines and trims continued from the year before except for the addition of the LM-1, a special low emission (and less powerful) 350 V8 for cars sold in California to meet the state’s stricter emission standards. California only: LM-1 350 V8 160 bhp @ 3800 rpm, 250 lb-ft @ 2400 rpm. 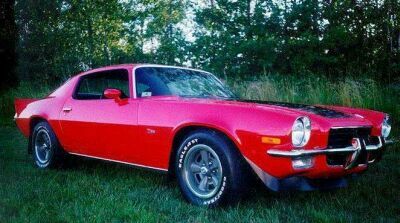 Comments: With extreme shortsightedness, Chevrolet eliminated the Z28 model for 1975. Maybe it was to save it from the utter embarrasement that the year’s engine choices would bring. The Camaro was now powered by only three catalyst-equipped engines, a 250 L6 rated at a pathetic 105bhp, a two-barrel 350 V8 rated at 145 bhp and a four barrel 350 rated at just 155 bhp. For some unknown reason, Camaros sold well this year. 250 I6 105 bhp @ 3800 rpm, 185 lb-ft @ 1200 rpm. 350 (2bbl) V8 145 bhp @ 4000 rpm, 250 lb-ft @ 2200 rpm. 350 (4bbl) V8 155 bhp @ 3800 rpm, 250 lb-ft @ 2400 rpm. Comments: There were a few changes to the 1976 Camaro, including a new aluminum panel between the taillights on the Type-LT, standard power brakes, and the availability of cruise control. The two barrel 350 was dropped to make way for an even weaker two-barrel 305 rated at 140bhp, while the four-barrel 350 received a power boost up to 165bhp. L-22 250 L6 105 bhp @ 3800 rpm, 185 lb-ft @ 1200 rpm. LG-3 305 (2bbl) V8 140 bhp @ 3800 rpm, 245 lb-ft @ 2200 rpm. 350 (4bbl) V8 165 bhp @ 3800 rpm, 260 lb-ft @ 2400 rpm. 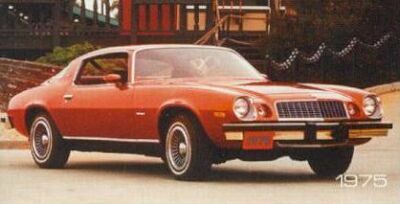 Comments: 1977 saw a few changes (including intermittent wipers), but the big news was the return of the Z28 model, this time as a separate model (instead of as an option package as previously) even if it now stressed handling and appearance instead of power. 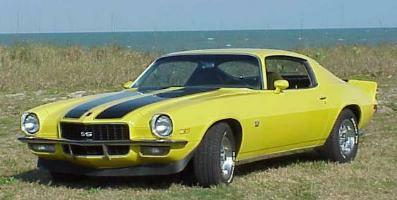 The Z28 did handle well, even if it shared the same 350 4-barrel V8. But even in this sad state, the Camaro was more attractive than the hideous Ford Mustang II and the Camaro outsold the Mustang for the first time ever. LM-1 (California) 350 (4bbl) V8 160 bhp @ 3800 rpm, 260 lb-ft @ 2400 rpm. LM-1 (49-state) 350 (4bbl) V8 170 bhp @ 3800 rpm, 270 lb-ft @ 2400 rpm. Z-28: 350 (4bbl) V8 185 bhp @ 4000 rpm, 280 lb-ft @ 2400 rpm. 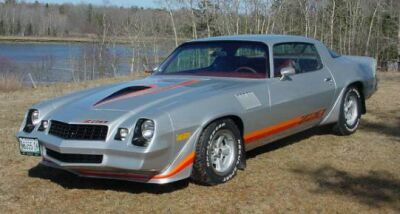 Comments: Chevrolet added a new nose to the 1978 Camaro that got rid of the ugly metal bumpers and used an all new body color urethane front and rear fascia designed to meet the new 5 mph crash standard. The rear taillights were also redesigned, and incorporated 3 color lenses with the fuel door in the center. The Camaro now was available in five models, Sport Coupe, Rally Sport, Type-LT, Type-LT Rally Sport, and Z28. Translucent (i.e. 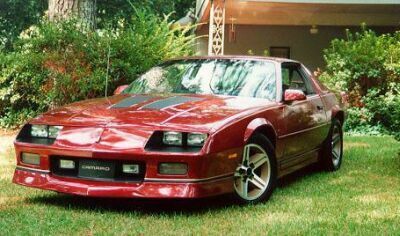 smoked glass) T-tops were available on all models, while the Z28 received a full disco body package with front fender vents and a fake hoodscoop, and a more powerful 350 rated at 185bhp. But increasing emission regulation in California forced Chevrolet to offer separate engines for California and the rest of the nation. The Camaro outsold the Mustang II again. L-22 (California) 250 L6 90 bhp @ 3600 rpm, 175 lb-ft @ 1600 rpm. L-22 (49-state) 250 L6 110 bhp @ 3800 rpm, 195 lb-ft @ 1600 rpm. LG-3 (California) 350 (2bbl) V8 135 bhp @ 3800 rpm, 240 lb-ft @ 2200 rpm. LG-3 (49-state) 350 (2bbl) V8 145 bhp @ 3800 rpm, 245 lb-ft @ 2400 rpm. Z-28 (California): 350 (4bbl) V8 175 bhp @ 3800 rpm, 265 lb-ft @ 2400 rpm. Z-28 (49-state): 350 (4bbl) V8 185 bhp @ 4000 rpm, 280 lb-ft @ 2400 rpm. Comments: The Type-LT was dropped for 1979, replaced by the new “Berlinetta” trim. All Camaros received a new instrument panel with more contemporary instrumentation and better control placement. Tighter emission controls resulted in slight drops in engine power across the Camaro’s extensive engine line-up. Still, a record 282,571 Camaros were sold for 1979, including a record 84,877 Z28’s, a feat that the Camaro would never top. L-22 (49-state) 250 L6 115 bhp @ 3800 rpm, 200 lb-ft @ 1600 rpm. LG-3 (California) 350 (2bbl) V8 125 bhp @ 3200 rpm, 235 lb-ft @ 2000 rpm. LG-3 (49-state) 350 (2bbl) V8 130 bhp @ 3800 rpm, 245 lb-ft @ 2400 rpm. LM-1 (California) 350 (4bbl) V8 165 bhp @ 3800 rpm, 260 lb-ft @ 2400 rpm. Z-28 (California): 350 (4bbl) V8 170 bhp @ 3800 rpm, 265 lb-ft @ 2400 rpm. Z-28 (49-state): 350 (4bbl) V8 175 bhp @ 4000 rpm, 270 lb-ft @ 2400 rpm. Comments: Hoping to improve fuel economy, the 1980 Camaro featured an anemic engine line-up which included a new Chevy odd-fire 229 V6 rated at 115bhp (a Buick even-fire 231 V6 rated at 110bhp was available in California) which replaced the venerable and heavy L6 engines, and a new 267 V8 rated at a pathetic 120bhp. Power for Z28 models actually increased as the 350 V8 was rated at 190 bhp, except for California buyers who received a 305 V8 rated at 155bhp which was mated to a standard three-speed automatic (no manual transmission was available). Due to the fuel crisis, sales dropped dramatically to 152,005 units. LC-3 (49-state) 229 V6 115 bhp @ 4000 rpm, 175 lb-ft @ 2000 rpm. LD-5 (California) 231 V6 110 bhp @ 3800 rpm, 190 lb-ft @ 1600 rpm. L-39 267 (2bbl) V8 120 bhp @ 3600 rpm, 215 lb-ft @ 2000 rpm. LG-4 (49-state) 305 V8 155 bhp @ 4000 rpm, 240 lb-ft @ 2400 rpm. LG-4 (California) 305 V8 155 bhp @ 4000 rpm, 230 lb-ft @ 2400 rpm. Z-28 (California): LG4 305 V8 165 bhp @ 4000 rpm, 245 lb-ft @ 2400 rpm. Z-28 (49-state): 350 V8 190 bhp @ 4200 rpm, 280 lb-ft @ 2400 rpm. Comments: A new engine computer enabled all V8 engines to be 50-state legal, but power ratings dropped slightly across the board. The Rally Sport model was dropped (again) and the Camaro was available in just three trims: Base Sport Coupe, Berlinetta, and Z28. These model names would continue in 1982, but not much else. LC-3 (49-state) 229 V6 110 bhp @ 4200 rpm, 170 lb-ft @ 2000 rpm. L-39 267 (2bbl) V8 115 bhp @ 4000 rpm, 200 lb-ft @ 2400 rpm. LG-4 305 V8 150 bhp @ 3800 rpm, 240 lb-ft @ 2400 rpm. Z-28: LG4 305 V8 165 bhp @ 4000 rpm, 245 lb-ft @ 2400 rpm. Z-28: 350 V8 175 bhp @ 4000 rpm, 275 lb-ft @ 2400 rpm. Introduction: The third generation Camaros would see the first Camaros with factory fuel injection, four-speed automatic transmission, five-speed manual transmissions, four-cylinder engines (yikes! ), 16-inch wheels, and hatchback body styles. Comments: The third generation of Camaros debuted in 1982 as truly all new designs. They were the first Camaros built without front subframes or leaf-spring suspensions. The front end was now held up by MacPherson Struts and the rear used a long torque arm and coil springs. Engine choices were all new for 1982. 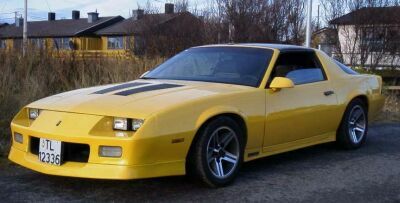 At the bottom of the performance scale, buyers could order a Camaro with a version of GM’s “Iron Duke” 2.5 liter four cylinder engine rated at a pathetic 90 bhp. Engine options included a 2.8 liter V6 rated at 112 bhp (which was the base engine in the Berlinetta), or a four-barrel carbureted 5.0 liter (305 cid) small block V8 rated at 145bhp (which was the base engine in the Z28). Optional in the Z28 was a “Cross-Fire Injection” (Throttle Body-Injected) version of the 5.0 V8 which was rated at 165bhp. The carbureted 5.7 could be mated to a manual or automatic transmission, but the Cross Fire 5.7 was available with an automatic only. A 350 T-Top Camaro once again paced the Indianapolis 500 and the silver and blue replica cars are some of the most attractive of the 1982 models. It is sad to note, however, that the real pace car used a highly modified 350 V8 that wasn’t available to the public. 5.0 Cross Fire Injected V8 165 bhp. Comments: The Z28 saw a nice power bump with the introduction of the “L69” engine option. This added a Corvette-spec camshaft, revised exhaust and reworked four-barrel carb, which boosted the power output of the 5.0 L69 “H.O. V8 to a more respectable 190bhp. All of this power could also be hooked up to a new five-speed manual transmission. L69 5.7 H.O. V8 190 bhp. Comments: The troublesome Cross Fire Injected 5.7 engine was dropped as most performance buyers went for the L69 5.7 engine. A new four-speed automatic (the “700R4”) was now available and the Berlinetta featured a funky digital instrumentation panel and overhead console. Hopefully, the digital instruments were more entertaining than the V6 that most Berlinettas had. Comments: Camaro made a big step forward in performance with the addition of a new model, the IROC-Z, which was named after the International Race of Champions, which pitted drivers all driving identical vehicles – in this case the Camaro. The IROC-Z featured big 16″ five-spoke wheels and unique graphics. Carbureted versions of the 5.0 were still available, but the big news was the addition of a Tuned Port Injection (TPI) version of the 5.7 for Z28 and IROC-Z models which was rated at a respectable 215bhp. Unfortunately, the TPI 5.7 was only available with the four speed automatic transmission. The Base Sport Coupe and Berlinetta had to make due with a new fuel injected version of the 2.8 V6 which was rated at 135bhp. 5.0 TPI V8 215 bhp. Comments: 1986 Camaros received a funky blister atop their rear hatches to accomidate the new federally mandated center high-mounted stop light (CHMSL). There was also a new exhaust system for non-Z28 cars and a new basecoat/clearcoat two-stage paint system. Comments: Performance returned in a big way for 1987 with the return of the 5.7 (350 cid) as an option on the IROC-Z. Using the TPI system, the 5.7 was rated at 225bhp, the most horsepower in a Camaro in 13 years, and had much better driveability. While the TPI 5.7 was only available with an automatic transmission, the TPI 5.0 was now available with a five-speed manual transmission. 1987 also saw the return of the convertible body style and the demise of the four cylinder engine. 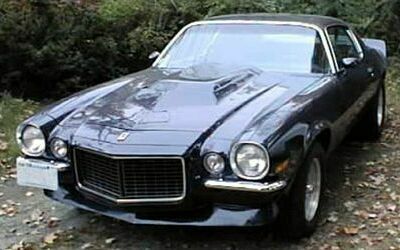 The High Output 5.0 engine was dropped and a new 5.0 V8 rated at 165bhp became the standard Z28 engine. The Berlinetta model was also dropped and was replaced by an “LT” option package. Camaros fitted with a rear spoiler had their CHMSL built into the spoiler, instead of on an ugly housing on the glass. IROC: 5.7 TPI V8 225 bhp. Comments: Chevrolet decided to simplify things in 1988 and made the spoiler standard on all Camaros. As the IROC name was firmly established, Chevy again dropped the Z28 model, and all high performance Camaros were now IROCs. 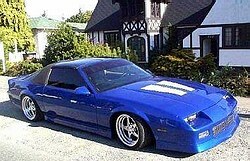 Base Camaros received the old 15″ five-spoke wheels from the Z28 as well the Z28’s lower body skirting. The Z28’s 5.0 V8 was now optional on the sport coupe, and it gained a throttle-body fuel-injection system to make 170bhp. IROCs could be ordered with the rare 1LE road racing package which included oversize disc brakes, an aluminum driveshaft and a tweaked suspension. Comments: The Rally Sport returned for 1989, but was renamed the “RS.” The “RS” trim was basically a trim package atop the base sports coupe and featured either V6 or 5.0 V8 power. The IROC’s 5.7 TPI V8 was now rated at 240bhp, but the only visual difference between the 1989 IROC and previous years was the use of a “Pass Key” theft deterrent resistor in the ignition key. IROC: 5.7 TPI V8 240 bhp. Comments: The IROC was dropped after the short 1990 model year, as Dodge picked up sponsorship of the series. The base V6 was enlarged to 3.1 liters (and gained 5 bhp) and driver side air bags were added to all models. Comments: Chevy brought back the Z28 model in the Spring of 1990 which pretty much picked up where the old IROC left off. The Z28 came with a new tall rear wing, new lower body cladding, new phony hood scoops, and new five-spoke wheels, but was basically last year’s IROC model. The top 5.7 TPI engine now put out 245bhp. 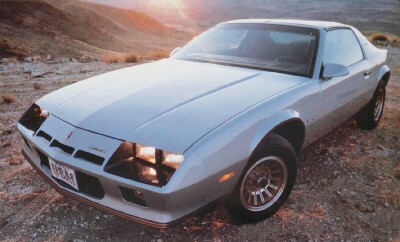 Lesser Camaros were pretty much unchanged from 1990, except for the addition of fake air inlets. A rare option was the Camaro B4C pursuit vehicle, which was available only to Law Enforcement agencies. The B4C was basically a Z28, badged as a RS, with some of the goodies of the 1LE race package. Very few were built. IROC: 5.7 TPI V8 245 bhp. Comments: The Camaro received few changes for 1992, the last year of its third generation. 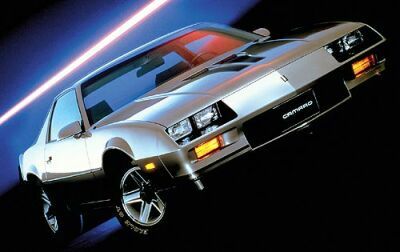 All Camaros sported a “25th anniversary” badge on their instrument panels. Furthermore, a $175 “Heritage Package” of stripes was offered on any Camaro. 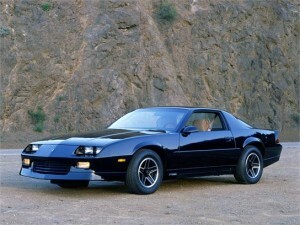 Introduction: The fourth generation would be the greatest, and last, generation for the Camaro. These Camaros are, without a doubt, the fastest, most powerful Camaros ever built. But declining sales could not save them from cancelation after the 2002 model year. 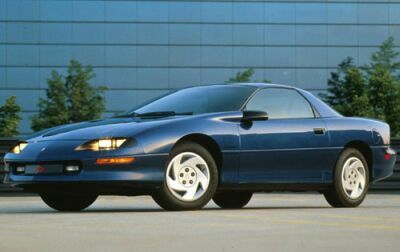 Comments: The Camaro was all new for 1993, the start of its fourth, and last, generation. All though most of the floor stamping and rear suspension was carried over, the 1993 Camaro featured new plastic front fenders, a new short-arm/long-arm front suspension, rack-and-pinion steering, and an all new sleek styling. The model lineup was simplified to just the base Sport Coupe powered by a 3.4 liter V6 rated at 160bhp and the Z28 with the Corvette’s 5.7 liter LT1 small-block V8 under-rated at 275 bhp. Once again, the convertible was gone. The LT1 was easily the most powerful small-block installed in a Camaro since its namesake, the 1970 LT-1 (note the dash), and, considering the change in gross vs. net ratings, may have been more powerful. The Z28 could be ordered with either a four-speed automatic or six speed manual transmission, and came standard with 16 inch wheels and tires, four wheel anti-lock brakes, and a black colored roof, standard. 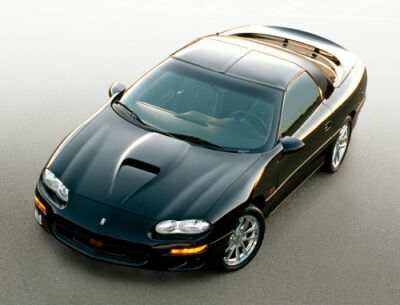 Z28 prices started at less than $17,000, making it a true performance bargain. Once again, a Camaro paced the Indianapolis 500 and black replica cars were offered. Unlike 1982, no modifications were necessary on the actual pace car. 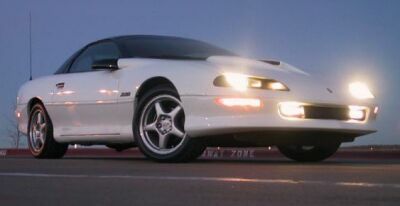 Z28: LT1 5.7 V8 275 bhp @ 5200 rpm, 325 lb-ft @ 2400 rpm. 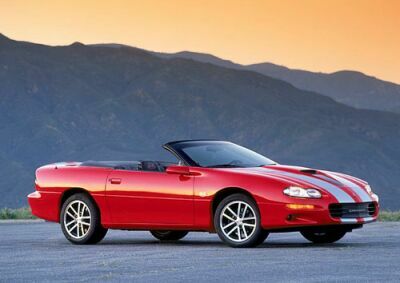 Comments: The convertible returned for 1994, with a significantly stiffer chassis than previous versions. The automatic transmission in both the convertible and sport coupe was now an electronically controlled version of the 4L60. Comments: The Z28 received only minor changes for 1995, including available traction control and all-season tires. A 3.8 liter V6 (the “3800”) rated at 200 bhp was now optional in the base sport coupe. SS: LT1 5.7 V8 305 bhp. Comments: To celebrate the Camaro’s 30th anniversary, Chevrolet offered a specially optioned white Z28 with orange stripes and orange houndstooth upholstery (just like the 1969 Pace car). 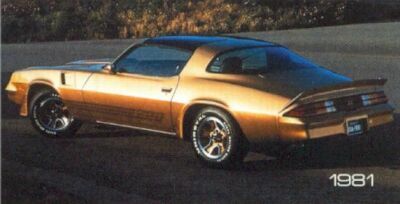 Otherwise, new “tri-color” taillamps were added to all models and SLP produced an extremely limited run (106 cars) of Camaro Z28s equipped with the Corvette LT4 5.7 liter V8 rated at 330bhp. SS: LT1 5.7 V8 330 bhp. Comments: The Camaro received its first (and only) styling update in 1998 with the addition of a new front fascia. 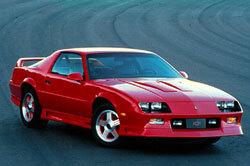 But the big news was under the hood where the Z28 received the Corvette’s new all-alluminum small block, the LS-1. The first all-aluminum Camaro engine since the 1969 ZL-1, the LS-1 was rated at a strong 305bhp. Furthermore, Chevrolet made the SS model official by producing it itself, and it featured the LS-1 with standard Ram Air to generate 320 bhp. 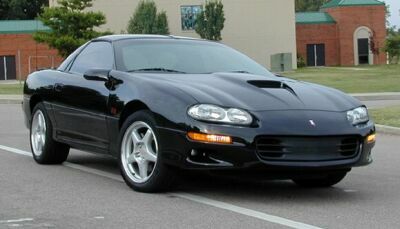 Z28: LS1 5.7 V8 305 bhp @ 5200 rpm, 320 lb-ft @ 4400 rpm. SS: LS1 5.7 V8 320 bhp @ 5200 rpm, 345 lb-ft @ 4400 rpm. 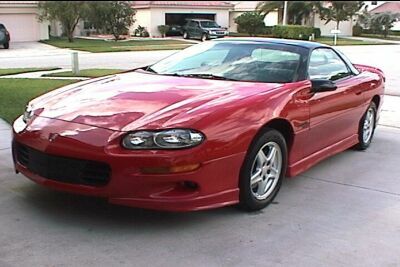 Comments: The 1999 Camaro continued with the only changes being an electronic throttle control on V6 models, a new oil life monitor, and a Torsen limited slip differential. Comments: The only changes for 2000 were radio controls integrated into the steering wheel, body-color side mirrors, some new interior fabrics, and an optional 12 disc CD changer. Comments: Once again, changes were minimal for 2001, with only restyled 16-inch wheels, a new paint color, and 5 extra horsepower for the LS-1 engine. 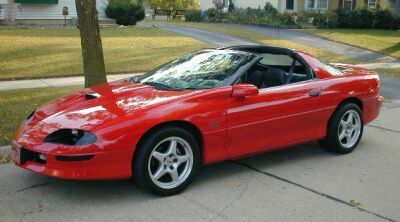 Z28: LS1 5.7 V8 310 bhp @ 5200 rpm, 335 lb-ft @ 4000 rpm. 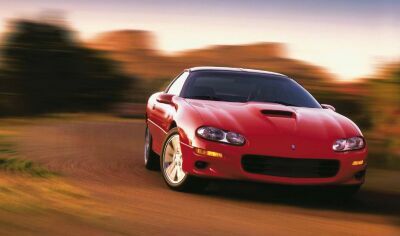 Z28: 0-60 in 5.5 seconds, 1/4 mile in 14.0 seconds @ 101.3 mph. SS: 0-60 in 5.3 seconds, 1/4 mile in 13.7 seconds @ 105.6 mph. Comments: The writing was on the wall, and 2002 would be the last year for the Camaro. Changes were understandably minimal and included new sound systems, a standard automatic transmission for V6 convertibles, and a new power steering cooler for Z28s. 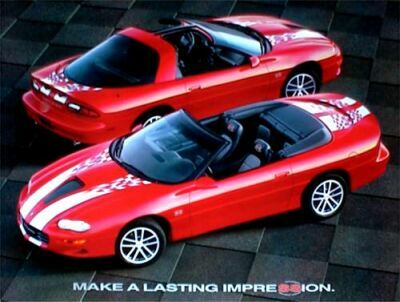 But Chevrolet did celebrate the 35th (and last) anniversary of the Camaro with a special graphics package for the Z28 SS coupe and convertible. 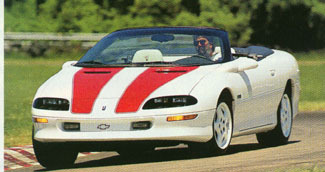 The stripes and logos of the 35th Anniversary package were attractive, but couldn’t keep the Camaro from being cancelled after the 2002 model year.